The very first car I bought with my own money was a Porsche 928,” Abigail Kampmann recalls fondly. She had to get rid of it when she had a family — “Porsche didn’t make an SUV at that time,” she laughs — but that first choice would prove to be prophetic. 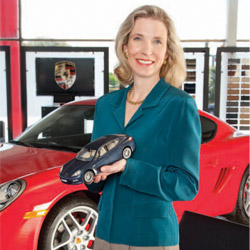 Currently general manager of the Porsche Center at Loop 410 and Fredericksburg Road, she also serves on the management team for her family’s eight luxury car dealerships in Texas and Tennessee and might as well have high end gasoline running through her veins. Kampmann grew up in the car business, and the Porsche Center where she spends 90 percent of her time is currently located in the same building as her father’s first dealership, North Loop Volkswagen, which opened in 1965. A “multitask machine,” Kampmann’s father was also a lawyer with the original team at Cox and Smith. He stopped practicing law to sell cars full time in the 1980s and is still very active. “He truly leads by example,” Kampmann says. A strong example, clearly. Kampmann also became a lawyer, specializing in tax law and estate planning, and even worked at Cox and Smith. However, after 13 years, she left the law behind to go into the family business. Kampmann is a big believer in the learning process. 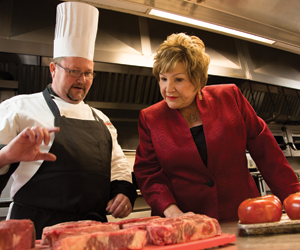 While she had picked up a lot of expertise over the years, she enrolled in the same dealer school in Virginia that many store employees are sent to — six one week sessions over the course of a year — in order to learn the industry in depth. She was able to attend a specialized course geared specifically toward children of car dealers and other successors to a family business. “We were really able to relate to each other,” Kampmann laughs. After dealer school, she worked at the family’s BMW store and then in the corporate offices before coming to Porsche in January. She currently works five to six days a week, spending about 90 percent of her time at the Center and 10 percent at the family’s corporate offices. “The corporate work is important, but I like to actually be at the store. I’m very handson,” she says. Since Kampmann joined the Porsche Center, it has received what can only be described as a woman’s touch. Fresh paint, repairs and a renovated, redesigned ladies’ room are all evident. Kampmann also installed the “fitting room,” a high end lounge space on the dealership floor with a coffee table, flat screen television, glossy magazines and soft chairs. Customers can relax in comfortable surroundings and slowly begin to notice the adjacent promotional materials outlining Porsche’s luxurious paint finishes and upholstery options. Kampmann has hired the Porsche Center’s first female salesperson, Aileen Arrambide, who also happens to be bilingual. While Porsche hasn’t had many female customers, Kampmann feels that’s changing. “Women tend to like SUVs, which is why I am so excited about the new Cayenne. It is so woman friendly,” she explains. This year’s version is the next generation for the Cayenne, originally launched in 2003. The Cayenne S and Turbo models are more streamlined inside, with an intuitive feel and iPhone and Bluetooth options. This fall, Porsche will launch its first hybrid, the Cayenne Hybrid. Longterm relationships with customers are common because of Porsche’s unique design and manufacturing as well. Porsche is known as a nearly artisan style brand. “Sometimes seven months can pass between placing an order and the car’s arrival,” Kampmann says, “but it’s still a very fluid process” — a process that supports ongoing communication, repeat business and loyalty. The service department is reliable and trustworthy — “we get spontaneous, unsolicited compliments weekly,” she says. Having adequate staff is crucial to this level of care, and Kampmann has been able to increase the number of service techs since joining Porsche, even in this tough economy. She oversees a long hiring process and tries to promote from within as often as possible. Brand loyalty extends to staff as well. “I recently hired someone who had been with Volvo for decades. He said Porsche was the only other line he’d work for,” she says. Lately, she’s spending more time in the corporate offices because the dealerships are getting more complicated. The family has four franchises in San Antonio: BMW, Porsche, Volvo and Mini. They run the fourthlargest Volvo dealership in the United States. Juggling customer service, marketing, Internet and social media presence, human resources, legal matters, notes and titles and financing simultaneously equals longer hours. Kampmann stays involved in most of the final hiring decisions for all stores. “It’s a combination of hiring the right people, with the right attitude, then training, training, training,” she comments. The biggest, most exciting project on the horizon for Kampmann is right back at Porsche, however. The Porsche Center will be moving from the old North Loop Volkswagen location to a new facility at I-10 and Wurzbach Parkway. The new space will double the showroom and lot square footage and be LEEDS certified. Kampmann says the project is moving quickly; the equipment is all picked out and the main vendors have been chosen. She’s planning a launch event for customers and the public on Wednesday, June 30, at 4 p.m. In addition to the groundbreaking ceremony, the event will showcase the launch of the new Cayenne. The new Porsche Center will open in the spring of 2011. 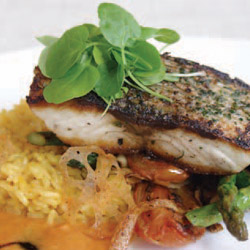 Always striving for excellence, Kampmann, her family and her team of employees have racked up considerable recognition. In 2009, they won the prestigious Center of Excellence Award for BMW, the President’s Award for Volvo, and two Elite of Lexus Awards for outstanding service and customer satisfaction. They have also won numerous President’s Awards from Toyota and Elite of Lexus Awards for the past 20 years. “Once the new Porsche building is open, we look forward to being a repeat winner of the Porsche Premier Dealer Award,” she adds. Kampmann has always been an active community leader. 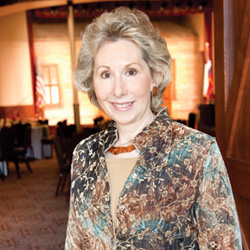 When she was practicing law, she served with the Texas Young Lawyers Association, working with schools and with seniors. “I’ve always felt a desire to protect those in society who can be taken advantage of,” she explains. After switching from law to cars, Kampmann ramped down her community involvement to concentrate on her new career. Today, she has one great community commitment close to her heart. Kampmann joined the Southwest Foundation for Bio medical Research board in 2006 and serves on the audit and nominations committees. She says with enthusiasm, “This is an internationally renowned scientific organization impacting the real world. Saving lives. I love being a part of that.” She has previously worked with the Southwest School of Art & Craft and the Mind Science Foundation. She also enjoys Western art and is excited about the opening of the Briscoe Western Art Museum. When questioned about how she spends her little leisure time, Kampmann laughs but prefers to keep her home life private. She will say, “I enjoy skiing, yoga and spending time with my family. I have fun with our children, who are active in soccer and Girl Scouts.” She is married to George Kampmann Jr., an accountant. “My husband is my best friend and a great listener,” she smiles. NextCellulite: What is it? Why do we have it? Can it be treated?